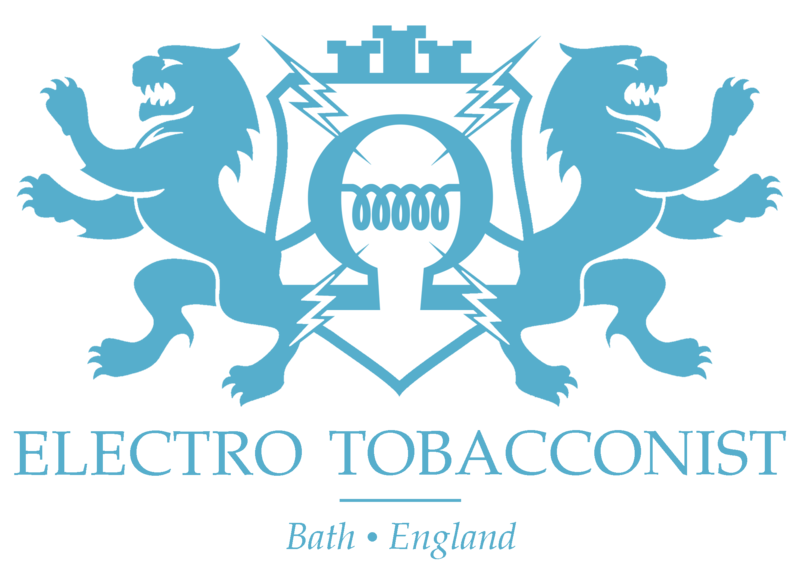 Here at the Electro Tobacconist we realise that as a customer you are sometimes met with terms or phrases whilst researching E~Cigarettes that you may never have come across before. To help you with this we have put together a glossary of terms so that you have a better understanding of the vaping world. If you don’t get the answers that you need here then please don’t hesitate to contact us and we will endeavour to get your answers to you as soon as possible via our live chat service or email. Atomiser (US: Atomizer): Electronic component that turns the nicotine solution contained within the e-cigarette into vapour. See Atomizer for details. Bottom Coil Clearomiser (BCC): A clearomiser where the atomiser and heating coil is located at the bottom of the clearomiser. Usually also filled from the bottom end of the clearomiser rather than from the top. Bottom Dual Coil Clearomiser (BDC): A bottom coil clearomiser with two coils. Provides more vapour and a stronger throat hit, but uses up batteries quicker than a single coil clearomiser. Bottom Vertical Coil Clearomiser (BVC): A bottom coil clearomiser with a single coil in vertical configuration. Cartomiser (US: Cartomizer): A combined cartridge and atomiser. Sometimes used to refer to a disposable electronic cigarette. Carts: Abbreviation of cartridges, which contain the propylene glycol solution which give the vapour of an electronic cigarette. Clearomiser (US: Clearomizer): A combined cartridge and atomiser with clear walls, which allow the user to see how much eliquid remains in the cartridge. Cigalike: An electronic cigarette that closely resembles a tobacco cigarette. Coil: Wire wrapped around a wick, to enableto the E-liquid, to heat up and vaporize. Most commonly used coil is Nichrome, and kanthal, and available in various resistances. Display: Displays are often used in Variavle voltage/ Variable wattage Devices. Depending on the device you’re using, they will tell you how much battery power there is left in your battery, what the ohm rating of your atomiser is, how high you’ve got the voltage/ wattage set to. The displays can be either LED, or OLED, again depending on your device. Disposable E-Cigarette: Designed to be thrown away after its e-juice has been used. Dipping: Refers to dipping an atomiser into e-juice prior to smoking. Dripping: Can refer to dripping a drop of e-juice on to an atomiser prior to smoking. Must be done with care to avoid damaging the atomiser. Drip tips: Were originally used to refer to a device used to drip several drops of eliquid directly onto an atomiser. Now sometimes used to refer to the mouthpiece of an electronic cigarette. Dry Smoking: Done when atomiser is flooded with solution. Remove mouth piece, take out cartridge, replace mouth piece and inhale. Be very careful to avoid damaging the atomiser by overheating it. ECITA: Electronic Cigarette Industry Trade Association: Represent the UK electronic cigarette industry. Members have to pay a monthly fee, adhere to strict standards and undergo strict twice yearly audits. Also campaigns for fair regulations on behalf of its member. Electronic Cigar: similar to the electronic cigarette (see below) but with a cigar style and flavour. Electronic Cigarette: A cigarette where an atomizer vaporises the nicotine which is then inhaled as vapour as compared to the smoke normally inhaled. Also known as the E-Cigarette, the E-Cig and even the E-Ciggy. Electronic Cigarette Starter Kits: Complete kits which normally contain batteries, atomisers, chargers, a manual and cartridges. Electro-fag: See Electronic Cigarette above, or electro-fag for example of usage. ENDs: Electronic Nicotine Devices, another term for electronic cigarettes. Frequently used in scientific papers on e-cigarettes. Some vapers like the term as it suggests the END of smoking. Flooding: Occurs when e-juice floods into the atomiser. LED: The light at the end of the cigarette (light emitting diode). This lights up when the user inhales, resembling an analog. Depending on the model, the LED may convey information to the user about the battery, i.e. flashing when the battery is running out or glowing green to show it is fully charged. Lithium-ion battery: (sometimes Li-ion battery or LIB) is a member of a family of rechargeable battery types in which lithium ions move from the negative electrode to the positive electrode during discharge, and back when charging. Li-ion batteries use an intercalated lithium compound as the electrode material, compared to the metallic lithium used in the non-rechargeable lithium battery. Mod: Name for an electronic cigarette which has been modified into a unique design. Mechanical Mod, also Mech-Mod: Basically a battery holder with an on button. These mods will have no software or display, and the only variance will be possible by the use of different batteries. Ohms: Used to measure the resistance of heating coils in atomisers. OCC Coil (Organic Cotton Coil): A coil which uses organic cotton which provides a pure and constant taste experience. Pen-Style: A particular style of electronic cigarette, known for its resemblance to a ball point pen. Pass-through Device/Battery: A device or battery that plugs directly into a computer or USB charger so that users can vape without having to worry about recharging their electronic cigarette. PG Propylene Glycol: A colourless liquid that forms the majority of the solution in the Electronic Cigarette. The liquid has been extensively tested for safety. Personal Vaporiser (or PV): An alternative name for the electronic cigarette. Resistance: Refers to the resistance of the coil in the atomiser (measured in Ohms). A lower resistance produces more heat and vapour. THR: Tobacco Harm Reduction: Much of the scientific support for the electronic cigarette has come from scientists involved in tobacco harm reduction. Topping: Topping up a cartridge with e-juice. Also known as topping off. Wick: A small piece of fabric or cotton which is found in the cartridge, and which holds the e-juice. Vape: To inhale vapour an electronic cigarette. Vaper: A person who vapes (uses an electronic cigarette). Vaping: The habit/pastime of using electronic cigarettes. Vaper’s Tongue: Refers to a loss of taste, from suddenly going off a flavour to losing all taste for flavours. VG: Vegetable Glycerine: Vegetable glycerine is a clear, colourless, odourless but very sweet liquid used as an alternative to propylene glycol by vapers who mix their own liquid. Some vapers maintain it increases vapour production.